Bill Bergin's strategy for the re-design of The Course at McLemore requires careful analysis of fairways, bunkers, greens and the natural topography. When you sit down to talk about a golf course's design with Bill Bergin, you can expect an almost exact description of its fairway dynamics, bunker placement and greens. His memory seems photographic as he describes the landscape. Even more impressive is his vision for its next phase. He talks about the views created from the re-contouring of a fairway. Or how the bunkers will be modified and shaped to enhance play. How he plans to open up the greens to improve visibility and placement. He talks about making the course more challenging for the seasoned golfer, as well as more approachable for the novice. To appeal to all levels of play as Bergin plans to do with the re-designed golf course at The Course at McLemore will be no small feat. It will require experience, insight, imagination and working with the natural landscape at the site. Here, we continue our series of interviews with Bill Bergin as he creates the strategy for The Course at McLemore and his partnership with Rees Jones on the project. 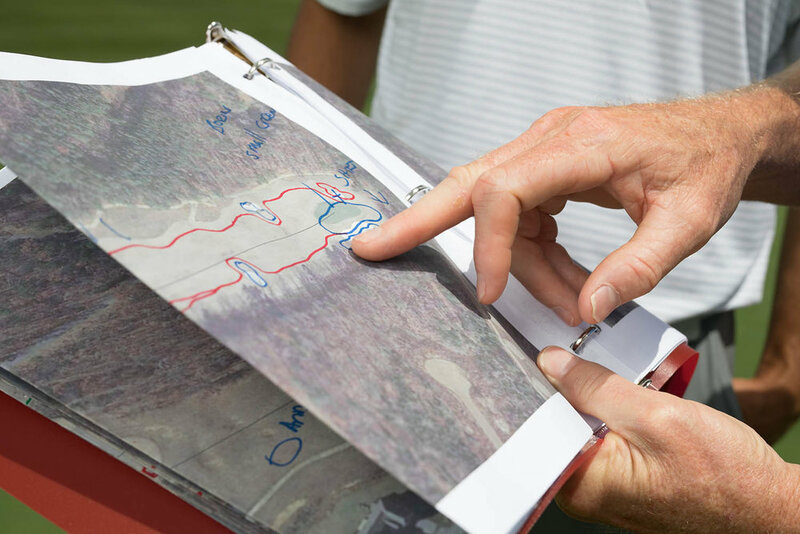 How do you design a golf course so that golfers can play strategically? We look at a golf course, and we start the project strategically. We ask ourselves how is it going to play, and how is it going to play for all types of golfers. So, as a former player, and as a teacher, and as an architect, that is of special interest to me. We take a lot of time in laying out the golf course, balancing shot values, using ups, downs, side angles, all kind of things that the property has to offer to create an interesting strategy. Now, conversely, for the recreational player, sometimes, strategy goes out the window on the first shot because most golfers do not hit the ball where they intend. So, they have strategic intent but sometimes lack the ability. In fact, even really good golfers lack strategic ability from time to time. It becomes this mix between your strategic intent and what actually happens with players, and then fusing that with the beauty of the land. Oftentimes when players hit their first shot they might transition into recovery mode. They are required to immediately adapt. At that point, strategy isn’t so important because it starts over on each tee. But during that process, we also look at giving players the ability to navigate their way around obstacles, around the golf course, play the game on the ground, feel like it’s set up, so they have a chance, and they have a mission that’s doable. So, it’s sort of a blending of what is perfect strategy and what is reality or realistic for the player. The Course at McLemore is an exciting project for me because I feel like we really can create these awe-inspiring views, whether they’re already here naturally, or we’re creating or adding to what’s here naturally. So, that’s exciting. Natural outcroppings of rock are a particular feature The Course at McLemore. How do you work with and enhance what the landscape provides? Sure. So, one thing that’s really interesting about this property, to me, is the abundance of views, the abundance of boulder-type massive rock, and also the trees. In the master planning process, when we’re going to adjust this golf course, those are areas that are actually easy to alter and take advantage of. Naturally, a big, massive, boulder like you see to the right of number one or that you go between the cart path going from seven to eight, well, that’s a given. That’s an easy situation. But then you have other spots on the golf course where we have a tiny bit of rock showing, and it looks like a blemish or a dirt spot rather than a rock outcropping. So, we will take those areas, and we will either eliminate them all together by bringing in enough dirt to cover them properly where grass can thrive, or we will actually expand and expose those rocks and then plan some natural vegetation around the non-playable side of the rocks to really make them part of the art—make them intentional rather than accidental. There’s a couple spots like that. The fourth fairway has a lot of small rock exposed in the fairway that doesn’t look good. It has spectacular rock exposed on the rise up from the tees to the fairway, and that should look exposed. So, two different things here. We are either going to enhance, or we’re going to eliminate. That will make it all look like we are in charge here. We’re intending it to look good. What are a few of the holes that represent more of a design challenge for you? We’ve got a vast area between the sixth and the ninth fairways. And we have a canyon through that area where the elevation changes dramatically. On the sixth hole, you play out to a plateau, and then it drops out of sight. I mean clearly out of site. Where on the second shot, for most players, they cannot see anything. That’s not a good thing. That’s not exciting. It’s just awkward and difficult. On the ninth hole, we have the tee set on the other side of the canyon, and they’ve got to cross it to get to the fairway. It’s a long carry for most players. To counteract both of those holes, we’re going to take the middle ground. The middle ground has a tree-lined ridge, if you will, between the holes that actually works as a extension to the sixth fairway. This means you can go down the left side of number six, and you can play further down that way, in my plan, than you can currently do so. And the more you move to the left, you can see the green. So, the hole opens up from the left side. From the right side, it’s sharp, and it’s blind, but it opens up from the left side. At the number nine tee, that same tree-lined ridge gets players closer to the tee ball. In other words, if you can’t quite hit it far enough to carry the canyon, you’ll have the opportunity to hook left to a new fairway that will be joined. I have a feeling that we will actually have fairway cut on those two holes that they share. It’s going to be a wide area. There will be a couple trees left in that area for beauty, but it will be a very wide area that makes both holes more playable. I’m really excited about it because that’s the most difficult physically. That location is the most difficult on the golf course. It could also be considered unfair for a lot of players. We don’t want people to come here and feel like, “I’m just not capable of playing those holes.” So, we’re really excited about what we’re going to do between those two. The canyon on number six is extremely dramatic, unusual. What are some courses that have similar features that have utilized the topography successfully? Well, I can name a couple. Waterfall up in the North Georgia Mountains at Lake Burton has a par three that drops out of sight like that. It’s all visible, but the hole drops a tremendous amount of footage between tee and green. Then in Alabama, Farm Links has a par three, also, that drops out of the sky. It’s their signature hole. Both of those do fine, but they did it over a par three, so you’re playing from a fixed position to another very low position that you can see. Our problem with number six being a par five is you don’t get to hit down the canyon from a fixed position, which causes golfers hit the ball all over the place. Right now, if players don’t hit it close enough to the edge of the cliff, they have to chip on their second shot to get into position and then play the blind shot. We really want to eliminate that. So, I’m not modeling after those by any means, but really, the point of discovering that bridge between the holes that allows us to get people closer to their intended target is the discovery that we’re pretty pleased about. Then back to the view. When we open this up, you’re going to be able to stand on the ninth green, and you’re going to look backwards all the way down. You won’t see sixth green from there, but the view of the mountains from that point going backwards is tremendous. Rees Jones is coming on board to work on The Course at McLemore with you. What has he been like to work with in the past? Yeah, I was fortunate to work on a project in Winter Haven, Florida with Rees Jones three years ago. It was a delight. It was a great learning experience. It was a successful project where Golf Digest recognized our work there as one of the best new courses in America. Reese is, obviously, an incredibly experienced architect. He’s worked all over the world, and he’s worked on some of the best golf courses all over the world. For us to work together, I think, is going to be an exciting opportunity. We became very good friends during that process and have continued to look at possible projects together. This is going to be a super opportunity for us to work together. I would assume being local, that I will carry the lion share, but Rees will have incredibly insightful and positive input during the process. How would you describe Rees Jones’ style as an architect? Rees and I don’t differ tremendously in that we both generally prefer grass face bunkers with sand in the bottom, which are very maintenance friendly. Strategically, he played golf for Yale University, and I played college golf and then professional golf on tour and was able to play in five major championships. Rees has designed probably many more than five major championship golf courses. So, that will be a nice collaboration—my playing experience and his design experience on championship golf. Bringing that to The Course at McLemore is going to be fun. We’re not looking to host a US Open at The Course at McLemore, but what we do want is an exciting challenge but one that’s really fair for the majority of players that play here. left to right—Bill Bergin, Rees Jones and Steve Wessier discuss the Course at McLemore. Two of golf’s most respected designers bring their world-class vision to the dramatic Lookout Mountain resort/hotel development. LOOKOUT MOUNTAIN, TN—Scenic Land Company announced today that Rees Jones and Bill Bergin, two of golf’s most legendary and innovative architects, have joined forces to re-design and renovate the Lookout Mountain Resort Golf Course, formerly Canyon Ridge Club. Sharing over 60 years of golf course design experience between them, Jones and Bergin have each created some of the most played and award-winning golf courses in the United States, including their most recent collaboration at the Country Club of Winter Haven in Orlando, Florida. Jones has designed or redesigned more than 225 golf courses in his career, including seven U.S. Open venues, eight PGA Championship courses, five Ryder Cups, two Walker Cup sites, as well as the President's Cup at The Royal Montreal Golf Club. Among his notable original designs are Nantucket Golf Club, Atlantic Golf Club, The Golf Club at Briar’s Creek, RedStick Golf Club, Ocean Forest Golf Club, Haig Point Club, Waldorf Astoria Golf Club, The Bridge and Cascata Golf Course. 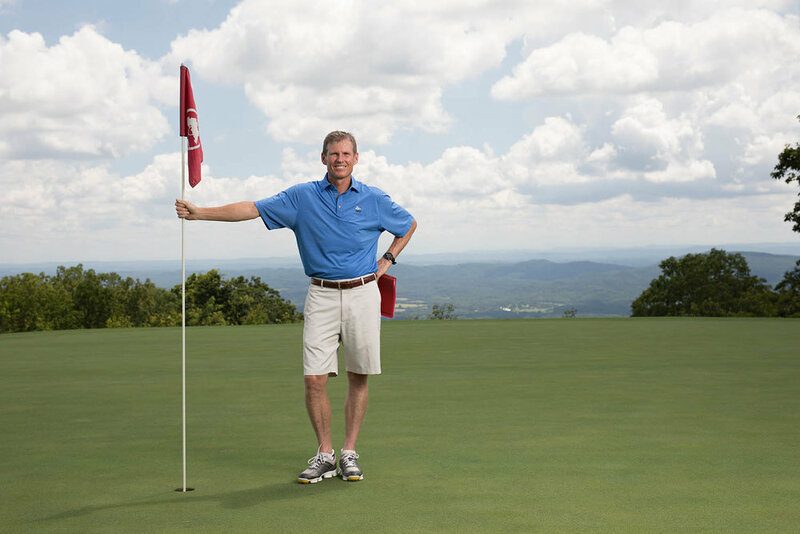 Joining Jones on the re-design and renovation at Lookout Mountain Resort Golf Course is Bill Bergin. As a professional golfer, Bergin played in excess of 250 professional tournaments worldwide, including three U.S. Opens, two British Opens, and more than 50 PGA Tour events. Bergin has been involved in the planning and design of over 50 projects, including The Club at Foxland Harbor, named one of Golfweek’s “2009 Best New Courses;” Oaks Country Club, selected as Golf Digest’s “4th Best Remodel in the US for 2015;” Chariot Run, Golfweek's “#3 Best Course You Can Play in Indiana;” Justin Timberlake’s Mirimichi, named Golfweek’s “#1 Best Course You Can Play in Tennessee;” and Chattanooga Golf & Country Club, an acclaimed Donald Ross restoration along the Tennessee River. At Lookout Mountain Resort, Jones and Bergin plan to enhance the greens complexes, optimize angles to green locations, and improve fairway and greenside bunker placements. They also plan to adjust yardages to create more variety and provide a world-class test for the game’s best players and accessibility for the beginners. Course strategy and planning by Jones and Bergin are already under way with potential groundwork being initiated as soon as 2018. Located a short 30-minutes from downtown Chattanooga and less than two hours from Atlanta, Nashville, Birmingham and Knoxville, Lookout Mountain Resort is planned to be a major branded, upper upscale/luxury resort, conference center with a mountaintop golf course and spa that will attract visitors from the Southeast, as well as national and international markets. Construction plans call for the hotel to be built on the eastern brow of Lookout Mountain overlooking historic McLemore Cove. To learn more, visit: LookoutMountainResort.com.